FrontAccounting est une application open source pour la comptabilité des petites et moyennes entreprises. Dérivée de webERP en 2007, FrontAccounting a été téléchargé plus de 100.000 fois. Misleading on system diagnostics (MariaDB), fixed. Adapting to google's error when getting exchange rates. Fixed. Backups/Restore: fixed compressed backup view, fixed obsolete ajax indicator during download. Google and Bloomberg Exchange Rate fix. System Diagnostics: fixed set of tested themes directories. Third party extensions installation fixed. Installed Third Party extension version display. Added VARLIB_PATH and VARLOG_PATH defines to simplify packaging. Password field in installer changed to hide text. Company Logo On Reports. Better Logo align. Added deferred income account and prepayment terms in init sql files. Void a Transaction: keeping date unchanged after transaction voiding to allow continuation on date. Reference edit boxes has been extended to show 16 chars instead of 10. New installer translations, updated gettext template. Fixed rounding differences in sales delivery and invoice. Sales Area list, added 'No Area Filter'. Fixed bank account auto-selection on Customer Payments page. Fixed printing sequences of Sales Invoices. Fixed a Shipping bug in Sales Order Report. Fixed redundant $sign in reports Sales Order, Sales Quotation. Added a Total Amount for Sales Orders Report and a Grand Total. (seems to be more useful than always selecting first item in selector). Added POS name in cash payment memo. Opening Balance bug in rep101.php (Customers Balance). 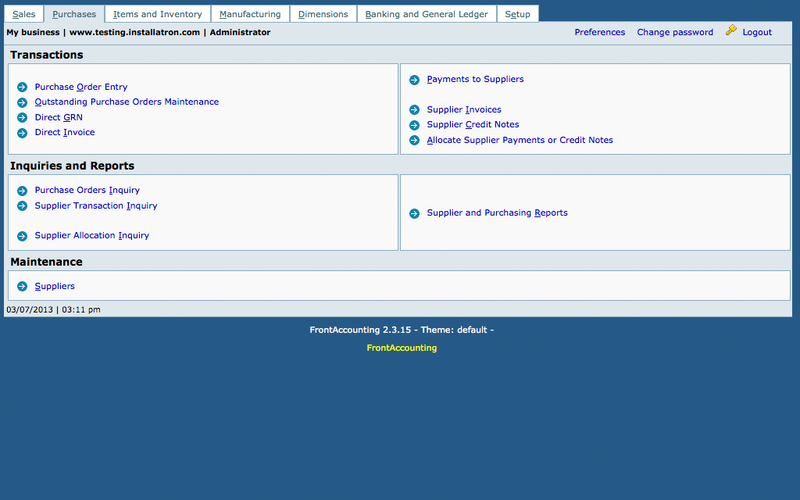 A white screen on Supplier Invoices and Supplier Credit Notes when no supplier defined. Fixed. Fixed redundant $sign in report Purchase Order. Bank Payment: for selected supplier payment set supplier account dimensions. New company setting 'Barcodes On Stock' implemented. Rep303 shows barcodes if set. Inventory Valuation Report showing 0 (zero) on Unit Cost and decimal precision fix. New Report: Inventory purchasing transaction based report. Fixed a minor weird bug in QOH in inventory Planning Report. Wrong error message in Save Items. 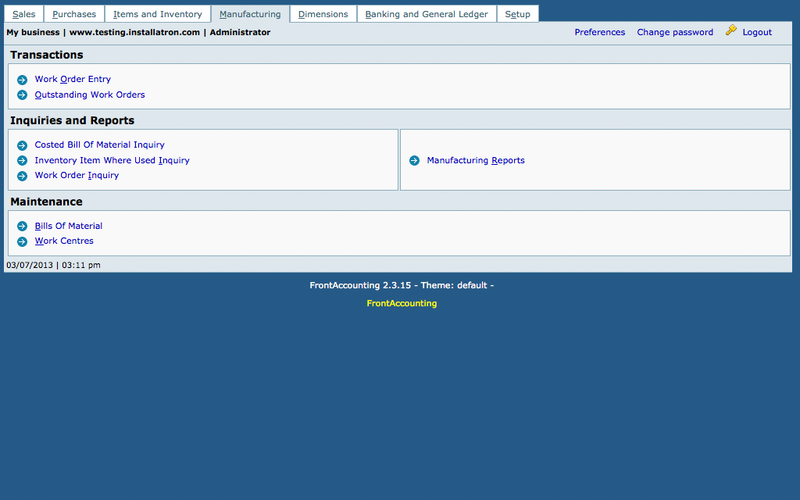 Stock Status display, Manufacturing Reports: fixed products on WO count. Work Order Entry, Work Order Additional Costs: fixed input data checks. Produce Finished Items: fixed broken document reference (changed input order). Better check for fixed assets. Sort Chart of Accounts by name. Fixed. Account Class/Group drill down added. Subledger list shows inactive records in Journal Entry. Fixed. Fixed get_shipping_tax_as_array() definition (default null as argument). Journal Edition: allow edit reconciliation status for bank related journals. GL Inquiry: search by memo, added journal edition link. Reconcile Bank Account: added memo display, added Reconcile All button. Changed GL Inquiry to also include the Reference Number. **  Top manufactured dashboard shows wrong statistics. Fixed. Fixed*  Tax Report on Screen. 12 Juillet 2016 - 30MBThis bugfix release contains all the changes introduced by previous revoked release, fixing also two smaller issues found in mean time, which potentially could impact internal applicattion security. This release also finally removed redundant info from Work Order Report and fixed a bug in Work Order Issue. Fixed deactivate_extension hook execution on extension deactivation. Improved safety handling of bad PHP interpretor releases. Fixed es_MX installer translation file. No display of shipping costs if there are no shipping costs on sales documents or views. Fixed net value calculations for GRN leading to unbalanced clearing account. Fixed hardcoded amout_row fixed 2 decimals. Removed and the default user_price_dec() is used. Fixed wrong calculaiton of standard cost during Advanced Manufacturing. Fixed correct calculation of stock_moves standard_cost when producing an Advanced Assembly. Fixed Material cost calculations for quantity = 0. Accounts entry. We only accept 0-9 and a dot if $accounts_alpha = 0 (default). Tax Report: duplicated lines were listed for edited transactions. 6 Avril 2015 - 30MBThis bugfix release contains all the changes introduced by previous revoked release, fixing also two smaller issues found in mean time, which potentially could impact internal applicattion security. This release also finally removed redundant info from Work Order Report and fixed a bug in Work Order Issue. Restoring compressed sql files sometimes failed due to nasty bug in php gzfile function. Fixed 'C' english language display on Install/Update Languages page, to allow its selection on first page. Fixed deprecated preg_replace in php greater than or equal to 5.3.0 with the /e flag in utf8 reports. Fixed ECB URLs 'Moved permanently' problem. Better CSS for combobox select. Fixed warning about non-existing HTTP_USER_AGENT session variable on some Plesk configurations. Fixed warning during database restore. Fixed problems with latin2 encoding due to changes in htmlspecialchars() behaviour in newer php versions. Extended length of email entries in company and locations settings. Moved page number on reports, when more than 1 page, on documents down 2 lines. Currency filter not working in documents. Fixed many issues in output HTML code according to HTML 4.01 Transitional format. Additional cleanups in standard themes. Added email uniqueness check in password reset feature. Fixed Windows specific access role editor issue. Improved layout Reports Customer Balances. Fixed contact record creation when new customer is added (reference/name were superseded). Fixed false quantity on hand errors on sales delivery. Fixed Quote Valid Days in System and GL Setup, Setup section. Missing update of shipping tax when crediting an invoice. The aging reports / inquiries had a 1 day error in presentation. Fixed. Wrong domestic opening balance in Report Supplier Balance for currency suppliers. Improved layout Reports Supplier Balances. Purchase order reference was not restored after last PO cancelation. Improved calculation of standard cost in advanced manufacturing even if qoh = 0. Allow search by Id in search work orders. Removed redundant info on Work Order Report. Fixed a bug in Work Order Issue. Issuing a stock always caused an error. Fixed deprecated preg_replace in php >= 5.3.0 with the /e flag in utf8 reports. User account should not be deleted if there are any entries on his/her name (you can still make the user inactive if needed). Fixed line overwrite in documents when using rtl language. Fixed RTL text in Graphics Engine, due to a bug in PHP function imagettftext. Improved readability in Graphics engine. x-legends for all languages. Fixed php5.4 specific problem with downloading extensions. New flag $use_costed_values in config.php for Inventory Valuation Report. New flag $print_item_images_on_quote in config.php for printing images on Sales Quotation. 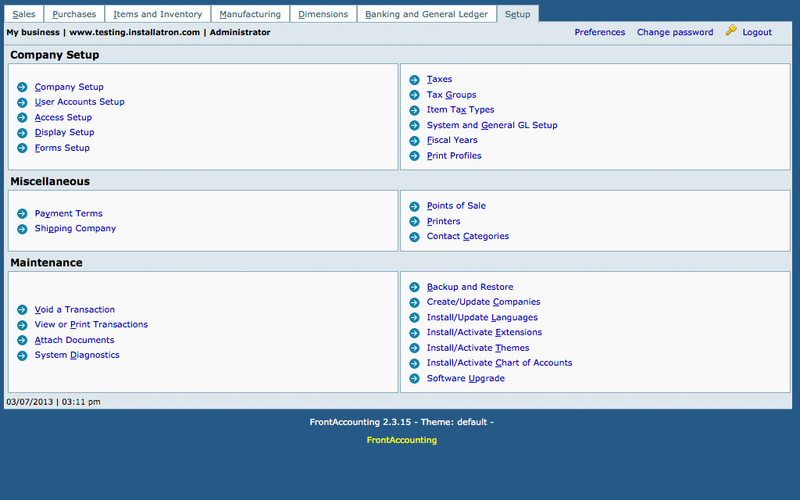 Updated default chart of accounts, en_US-new.sql and en_US-demo.sql. Fixed payments allocation for Customer Credit Note after crediting sales invoice. Added short name, name and tax id as search options in customer lists. Added customer search in Search not invoiced Deliveries. Set default Show Also Allocated to Yes in aged reports, just like on screen transactions. Added short name, name and tax id as search options in supplier lists. Fixed wrong parameter when saving Item Adjustment and Item Transfer (caused troubles in calculating standard costs). Improved Costed Inventory Movement Report. Item Cost Update will also change the stock moves standard cost to mirror correct GL postings. Fixed stock quantity checks to block transactions which would result in negative inventory status (if not allowed). Added sorting for number and name in Work Order Inquiry. Added new report Work Order Listing. Fixed a bug in exchange rate for GL postings. Improved Tax Report. Bank Payments/Deposits show 'order to/name' info in name column. Added option to allow user password reset (by Mithy). Changed decimal places in preferences to be number lists instead of input boxes. Selecting the cancel button in confirming the voiding of document did not work properly. Fixed sql mode setting for MySql databases greater than release 5.5. Redirect all database errors to error log unless $go_debug is switched on. When canceling a non finished sales quotation FA should not try to delete record. Allow changing currency on customer as long as no transactions exist. Allow changing currency on supplier as long as no transactions exist. Fixed email option labels in Supplier Reports. Fixed unexpected additional GL postings when tax was used in Supplier Invoice/Credit additional GL lines. Fixed image upload in Items. Sending location email when below reorder also in Items Transfer and Adjustment. Allowing more than one document attachment per number. Fixed a check that company logo exists when using header3. Fixed security issues in file uploads. Fixed back link presented when trying to modify fully invoiced Customer Delivery. Link customer payment entry after saving Invoice (if not cash). Supplier Payments: Fixed error during payment allocation in strict MySQL mode. Fixed bug in Supplier Credit Note allocation to Purchase Invoice. Supp credit notes should not be shown in allocable list. Fixed inventory valuation bug after voiding foreign supplier GRN leading to negative inventory. Inventory Items Movements always starts with 0 qty. Fixed. Payments, Deposits: fixed false error when payment is made in customer/supplier currency. Journal Inquiry (bank transaction view): fixed database error on bank transaction view triggered on some buggy MySQL versions. Avoiding redundant passes in Fiscal Year deletion. Supplier info not shown on gl inquiry for bank account. If no memo on GL line in GL account inquiry, the comments for the voucher is shown on the line. Page number is now printed on all documents (starting from second page). Fixed problem with login after intallation, when special chars are used in password. Supplier Payment, Payments, Bank Transfer: fixed account balance limit checks. Printer Profiles: fixed sql error on update under some MySQL versions. Added portuguese translation for installer. Some documents views didn't show new lines in comments. Fixed. Order Status Listing Report shows invoiced in heading rather than delivered. Receipts and Remittances now show discounts. Customer Payments: improved readbility and multiply cleanups in payments allocations. 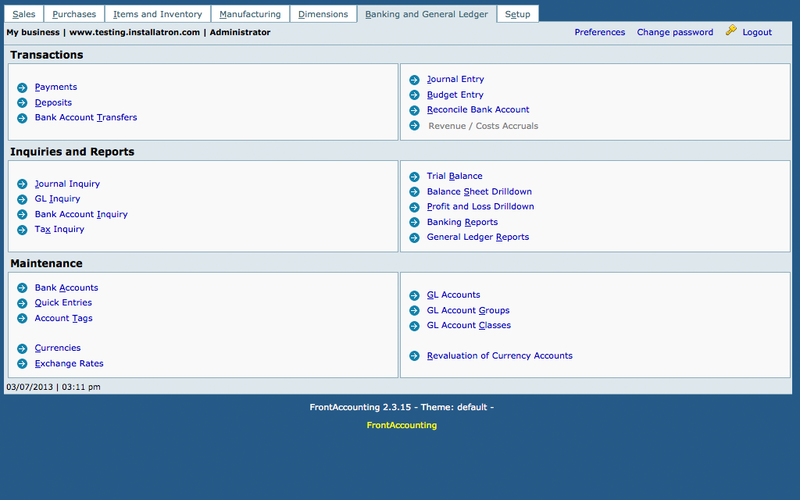 Customer Balances Reports: fixed error in recalculation to home currency value. 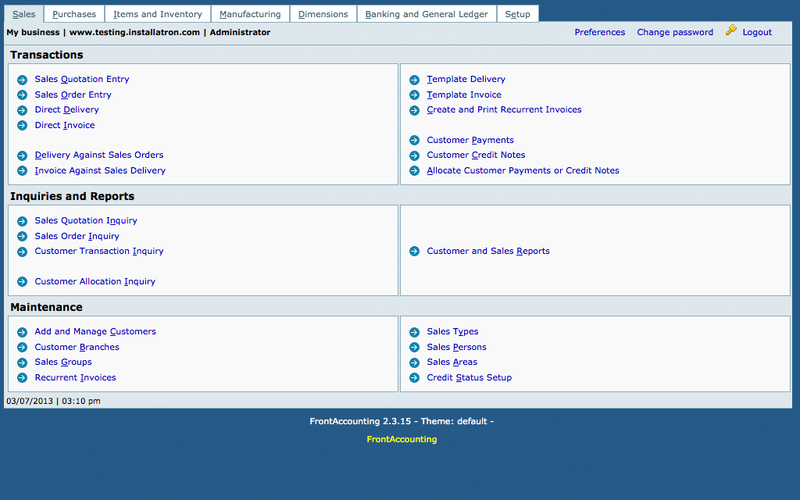 Customer Allocation Inquiry: fixed payment forms initialization, different icons for payment and allocation links. When automatic creating a branch the contact is also created on the customer. Supplier Invoice: tax was not updated on GRN line addition/removal. Payments to Supplier: improved readbility and multiply cleanups in payments allocations. Supplier Payment: small fix in fixed ui translation. Supplier Balances Reports: fixed error in recalculation to home currency value. Supplier Allocation Inquiry: fixed payment forms initialization, different icons for playment and allocation links. Supplier transactions now show supplier reference for PO Deliveries. Supplier Allocations: Bank Payments transactions were improperly available for supplier payments allocations. Supplier Invoice: Fixed tax input refresh after change in gl/grn items. Units of Measure: fixed edition problems when abbreviation contains special characters. Bank Transfer: fixed typo in input description. Fixed bug in bank history check resulting in false negative balance errors. Fixed amounts displayed in header for customer/supplier bank payments. Bank Transfer: roundings for transfers between two currencies are posted to exchange variance account. Bank Payment View, Bank Deposit View: fixed 'left to allocate' amount, added value in customer/payment currency. Bug no 2409 and 2410. Fixed headers and sql error when deleting a contact category. Customer/Supplier payments with amounts bigger than 1,000 was truncated. Fixed. Added F4 hotkey for item popup editor in sales documents. Fixed problem with customer payment allocations (invalid exrate stored in debtor_trans record). Customer Balances Report, Supplier Balances Report: balances in home currency were calculated using wrong exchange rates. Delivery Against Sales Orders: sales orders displayed as overdue after delivery date. Customer Payment: fixed bug with exchange rates resulting in invalid postings ts AR and foreign Exchange Gain Accounts. Customer Payment: fixed missing charge amount during edition, fixed submit button name. Bank Transfer: fixed problem with entering transfer between accounts of the same currency. faillog.php file moved to tmp subdir. Fixing cookie.txt location during access to remote exchange rate server. Uniform display of exchange rate across aplication, added xr_provider_authoritative option, fixed bug in stored rate value. Fixed session handling bug resulting in blank page on some pre-5.2 php versions. Fixed bug in get_next_trans_no() resulting in invisibility of new stock movements entered after some transaction is voided (applies to location transfer and inventory adjustment). Improved db_pager::set_sql to use array as well as query string. Improved db_pager widget sorting (now user column selection order is used). Fixed CSRF warning after retrying password change. Change password: added current password verification. Fixed mysql 5.0 issue in Print Statements report. Added missing db_write_hook in update sales order. Payments, Bank Transfer: Fixed payment limit checking bug. Direct GRN, GRN to PO, Direct Purchase Invoice: added exchange rate edition/storage on new transaction date. Fixed bug in voiding GRN/Purchase resulting in invalid average unit cost. Fixed nested forms in Items tab. Fixed qoh to return 0 instead of null when stock moves history is empty. Bank Transfer: additional field for target currency amount instead of exchange rate display. Fixed exchange rate ui to be editable for new rates only, bank payment/deposit use amount in supplier/customer currency instead of rate. Fixed problem with MIME headers in emailed documents on gmail (pdf files encoded in email body instead of attachment). Fixed bugs when printing Recurrent Invoices. When using templates for delivery and invoice, the lines and comments were missing. Crediting an invoice in transactions stated wrong invoice date. Improved Customer Balances Report. Option to choose last column as balance. Oustanding Orders Inquiry can be sorted by Customer, Ref and Order date. Add Clear/Reset quantity button to sales order delivery (handy when doing partial delivery of a big order). Optional switch in config file for sorting document lines by item code during Sales Order/Direct Delivery/Direct Invoice edition. 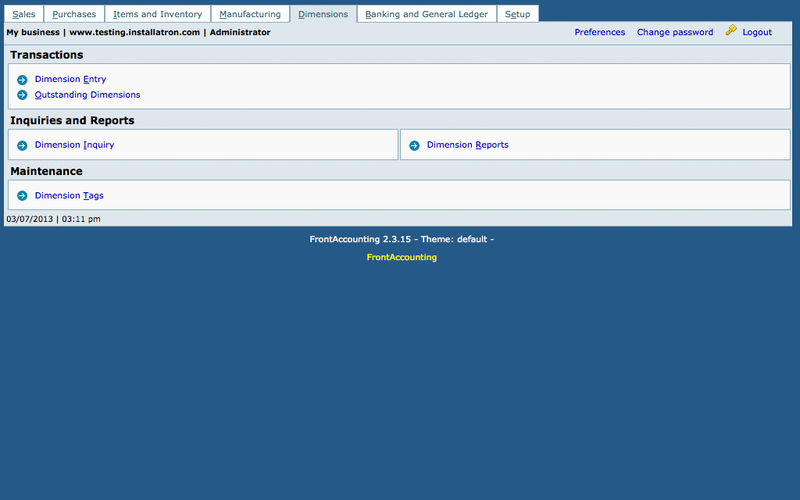 Removed voided transactions from Supplier Balances report. Fixed dimensions support in supplier invoice: supplier dimension (if any) overrides stock item defined dimension. Improved Supplier Balances Report. Option to choose last column as balance. Supplier credit note was not properly checked against sufficient quantity on hand. Changed supplier payment to accept amount in foreign currency instead of exchange rate. New Costed Inventory Movement Report added (rep308.php). New Items Sales Summary Report. Added 'Item Like' parameter to Stock Sheet Report allowing SQL LIKE or regexp filtering by item code. Added 'All locations' option in Stock Movements inquiry. 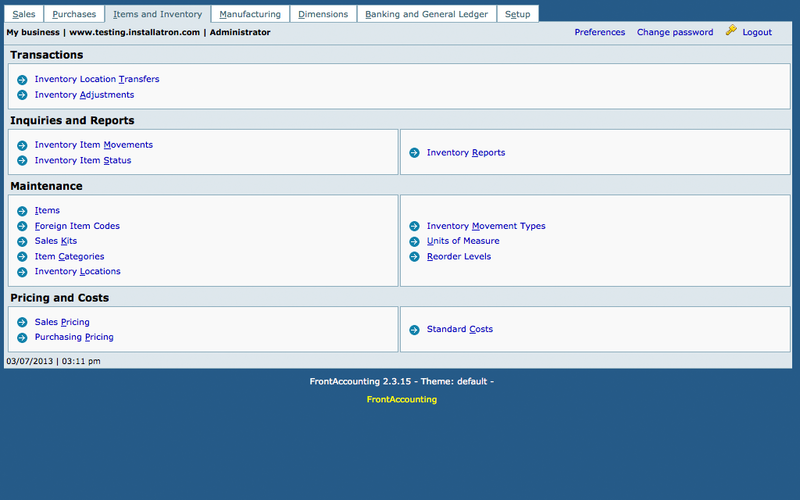 Auto search after location, user or item change in outstanding orders inquiry. Advanced assembly can now work with empty BOM. (use Issue for adding items). Dimension view balances were not updated after change in date range selection. Added Work Order selection option in types list selector in Journal Inquiry. Option in config file to exclude balanced transactions for past years from Brought forward column in Trial Balance.